Place: 20 years ago at a Waffle House in a fairly large city in the South…..Scene: Lovers dining on waffles, bacon and toast….Date: Valentine’s Day. About 20 years ago, before we were married, Mac was traveling and due to arrive at the airport the day before Valentine’s Day. I thought it’d be cool to surprise him since it was a weekend. So I got a hotel room, drove to the airport, found his truck (AMAZING that happened), stuck a note on the steering wheel (ALWAYS keep an extra set of keys) and headed to the hotel to ‘get ready’. I won’t go into details, but we had a good time…went to dinner, came back to the room, went to sleep or something. Around 1:30 am, the phone rings. Remember, 20 years ago, no one had cell phones. The desk manager says there is a distraught woman in the lobby and she won’t leave until she talks to her husband. The manager says he can’t tell her if her husband is in the hotel, but he can ring the room. WHERE is your STUPID IDIOT Sign when you need it???? BTW-they were separated and not living together…let’s just get that out of the way RIGHT NOW. Anyhoo, Mac does go down and talk to her, and she leaves. Guess she’s a little jealous and doesn’t really get the whole ‘Separation’ thing yet. The next morning, as we are getting ready to leave, Mac notices his truck is leaning….to the left and at the back of the truck. That seems odd. Turns out 3 of his 4 tires have really big holes in them….like the size of a big, gigantic, knife. So, the ex is crazy…nice to know. And really ~ knowing a little earlier would have been OK with me. Just sayin’. And in a classic turn, Mac replies: “A wretched, spiteful, straight-razor totin’ woman cut ’em”. Yes, Polk Salad Annie to the rescue. It took a little while for the Pep Boys to fix the tires, so we wandered over to the nearest restaurant…open on a Sunday morning in February ~ February 14th to be exact. And that’s why we have “history” with Waffle House on Valentine’s Day ~ I’d like pecans in mine, please. Don’t know Polk Salad? Check it out! Previous Internal clocks can bite me…. Dawn dish washing liquid will get the stain out of your shirt. Use an old toothbrush to scrub the stain and it should come out. Great story by the way. I LOVE it!!! Sorry that it happened to you but it makes for a super great story! ! 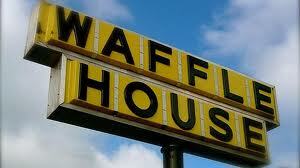 I’m pretty sure I’ve ended up drunk in a Waffle House in some state but I can’t remember…dammit. And I love me some Waffle House food and people ~ almost as good as the People of Wal-mart 🙂 I’ll go check out your page…after Mac’s party tomorrow. I am NOT responsible until at least SUNDAY morning! Glad to know the reason why you ended up at the Waffle House on Valentine’s day. I’m still laughing about it. Some traditions just won’t die…..and this is one of those and it’s a good one 🙂 Waffles, here we come!